Numerous software development models, used to depict and explain the arrangement of the software development activities, have been created over the years. These models range from waterfall to whirlpool (also known as agile). Each model has its strengths and weaknesses, and we will never be able to design the perfect software development model, where every interest in terms of time, money and features, as well as different peoples’ different personalities and preferences are considered and catered for. 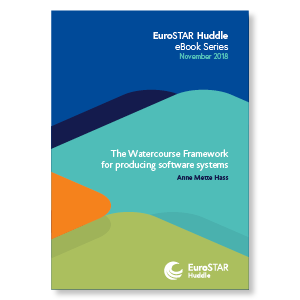 This eBook introduces you to the Watercourse framework. The framework is not a model in the sense that it does not describe a specific set of activities to be performed in a specific sequence, but a structure around which something can be built. The basic principle of the watercourse model (unlike that of the waterfall or a whirlpool model) is, that the development of a software system progresses peacefully over time, supported by test, test management and project management; like a watercourse with streams alongside each other. The main features of the watercourse model are the streams, the actors, and their communication. The framework may be applied to everything from an agile to a classic ‘one phase at the time’ model. See software development as streams running alongside each other. A framework for both agile and traditional development and a mixture of these methods. A framework based on streams, actors, communication, and phases. Mrs. Anne Mette Hass have worked with test and IT process improvement both theoretically and in practice in many different contexts. The hallmark of her work is overview and depth. She has worked in various types of businesses including test consultancy, the public sector, hardware producer, and the space industry in Denmark and other parts of Europe. Mrs. Hass has taught ISTQB software testing courses, and has written an internationally acknowledged book: “Guide to Advanced Software Testing”, second edition released October 2014. In 2009 Mrs. Hass received the European Testing Excellence Award. Mrs. Hass has been editor in the ISO working group for ISO 29119 Standard for Software Testing since 2005. Mrs. Hass also has an interest in processes around software testing, especially requirements engineering and configuration management; topics she has also taught and written books about. Anne Mette Hass has presented at EuroSTAR several times.